I needed quick and easy this week and fish tacos always fit the bill. This tangy Fresh Tomatillo Salsa from Rick Bayless goes together almost as fast as opening a jar and tastes wonderful drizzled over the savory bites of fish, crunchy cabbage and creamy avocado slices. Rick Bayless calls this his "default salsa" because it is so quick and easy and says to serve it within an hour or so before the flavor start to fade. 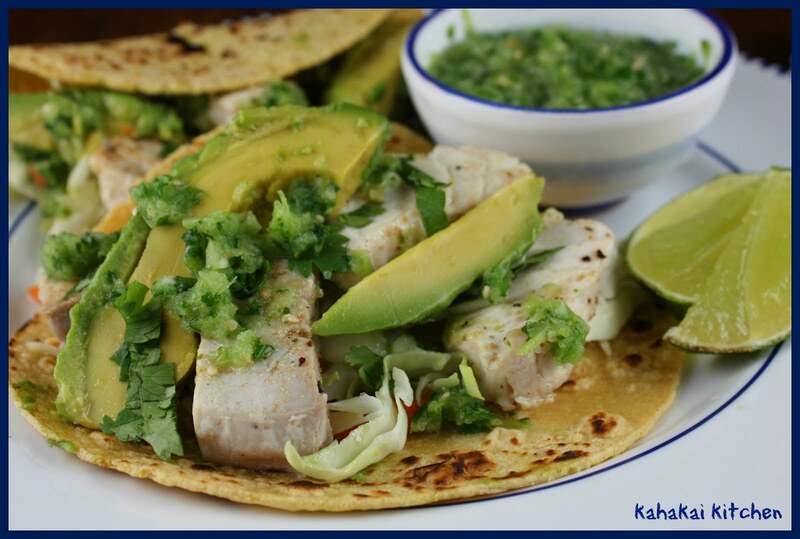 I made a half-batch to put on some fish tacos and found it was still plenty tasty the next day. Combine the tomatillos, garlic, chile and cilantro in a food processor or blender. Add 1/4 cup water and a generous 1/2 teaspoon salt. Process to a coarse puree; if using a blender, begin blending on low, at first pulsing to get the mixture moving evenly through the blender blades. Pour into a salsa dish and thin with a little more water if necessary to give the salsa an easily spoonable consistency. Taste and season with additional salt if you think necessary. Notes/Results: The salsa has a great green and tangy flavor and a nice kick from the serrano chile. For the tacos I used some local tombo ahi (the Hawaiian name for tropical albacore tuna), light and mild. 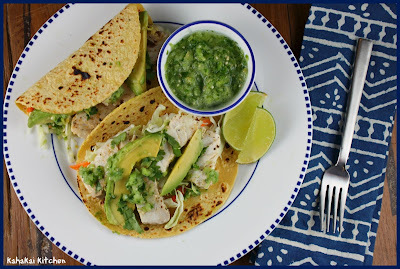 Salsa verde is always a nice change of pace from red salsas and I like it better with fish. I would make this salsa again. Mmm I am definitely craving tacos with fresh homemade salsa after reading this! Especially such easy peasy green salsa. I prefer green salsas over red! Also, I have a fantastic salad that I posted today for Souper Sunday!! I keep saying I'm going to try fish tacos. Your pictures are pretty much sealing the deal. They look light and fresh. I think this salsa is perfect for the tacos--the whole dish looks like it is bursting with flavor. I always love reading your posts because I know each and every one will be fresh, healthy, light, and delicious. I also like how you write Notes about the recipe to give us tips or suggestions. Very helpful. I am a fan of Rick Bayless too and wish I could visit his restaurant in Chicago, but alas I live nowhere close. Seriously yum. I'm going green next time I fix fish tacos... This looks decadent! Looks wonderful! I can never find tomatillo over here! And I've made a simple but so delicious salsa too! I'm a huge fan of fish tacos, but no one else in the house will eat them. It's a shame really. 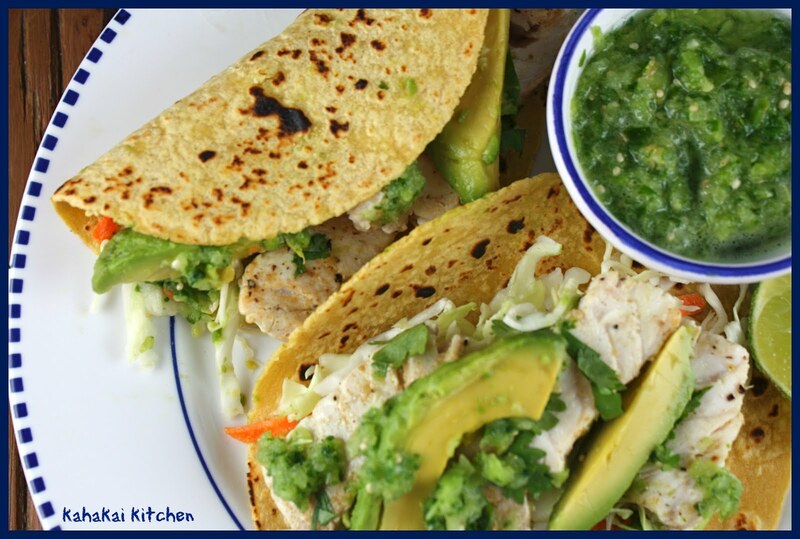 Love the looks of yours fish tacos with all that lovely green salsa and creamy avocado.